A 19-year-old Aussie emailed the Valve boss to complain that he wasn't flown in for the boycott-bustin' playtest of Left 4 Dead 2. Gabe Newell's reaction, allegedly (and in fun), was to announce a boycott of his own. 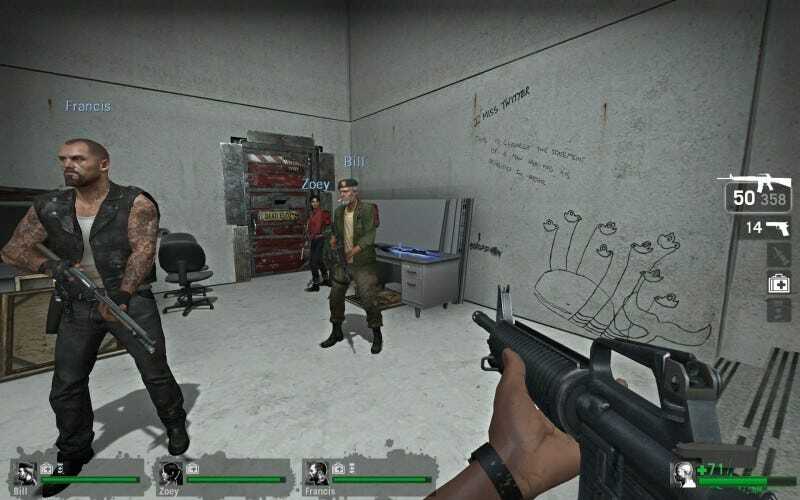 The modder, Joe of Joe's Modding Menagerie, is putting together a campaign for Left 4 Dead (pictured, above. Note the "I miss Twitter" graffiti.) He's apparently friendly enough with Newell that the Valve managing director answers his emails. He's even autographed a prop graphics card. But Joe felt snubbed by the corrupting/co-opting/olive branch offering to the Left 4 Dead 2 boycott leaders, and sent Newell this email with the header "I think you just opened up a can of worms: Why the hell haven't I been flown to Valve? I mean, you guys need to preview my campaign." Newell's arch reply: "We are boycotting your campaign." Playing shocked, Joe asks if that means he has to fly Newell to Brisbane for him to preview the mod. Newell ups the ante. "Me and Erik [Johnson, Valve project manager]," he answers, cc'd to Johnson. So what's left to be done? Boycott a boycott? Two of those won't make a right here. Instead, Joe has begun a fund drive to collect enough money to fly both down to Brisbane to test out his campaign. A ticket from Seattle to Brisbane runs about $1,000, U.S. Joe has $6 (Australian) in donations so far. 1) This is all a big gag, although the donation total is up to $375.75, with $100 of that coming from Valve's Robin Walker, who writes: "This is Robin Walker, from Valve. The rest of us at Valve would sure appreciate a couple of days without Erik around, so thanks for organising this! Quick question though: if I donated more, would you buy a one-way ticket for him?" So who knows where this is headed. 2) Nobody is pissed at anyone. It's clearly a parody of the rush to boycott things that displease you in games. Although I do acknowledge that my aside "Or was anyway," commenting on Joe's good terms with Gabe, carried not enough of an ironic tone and created confusion for some that Joe really is PO'd. He's not. So that's why I edited the lede. Everyone's having a good time.